Governor Matt Bevin is not afraid to say what unhinged, lightly treasonous fear mongers are thinking, and he said it to a crowd of them at the Value Voters Conference in D.C. on Saturday. The roots of the tree of liberty are watered by what? The blood. Of who? The tyrants, to be sure. But who else? The patriots. Whose blood will be shed? It may be that of those in this room. It might be that of our children and grandchildren. If Hillary Clinton is elected president, the Governor of Kentucky may be pushed to send his children to do what, exactly? Mount an insurrection? Sacrifice each other on the White House lawn? 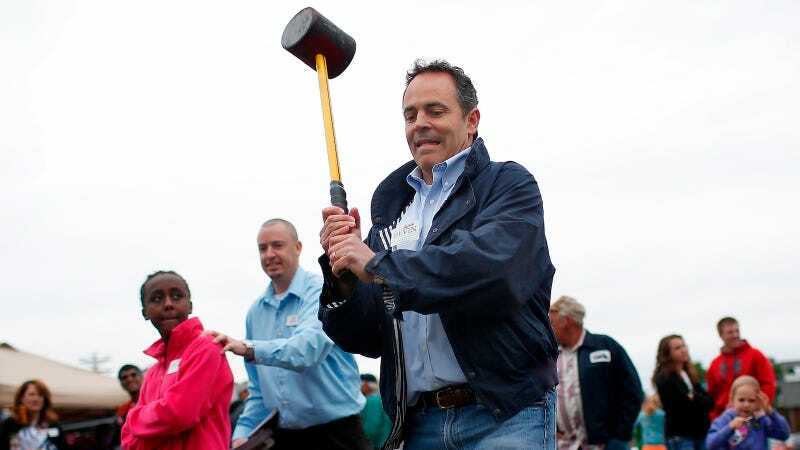 According to the Lexington Herald Leader, Bevin also said, “I want us to be able to fight ideologically, mentally, spiritually, economically, so that we don’t have to do it physically...But that may, in fact, be the case,” so the blood thing is not metaphorical. Today we have thousands of men and women in uniform fighting for us overseas and they need our full backing. We cannot be complacent about the determination of radical Islamic extremists to destroy our freedoms. Nor can we allow apathy and indifference to allow our culture to crumble from within. We need strong leadership at every level of government to defend our Constitution and our republic. We must fight to preserve the exceptionalism and the promise of America, because America is worth it.